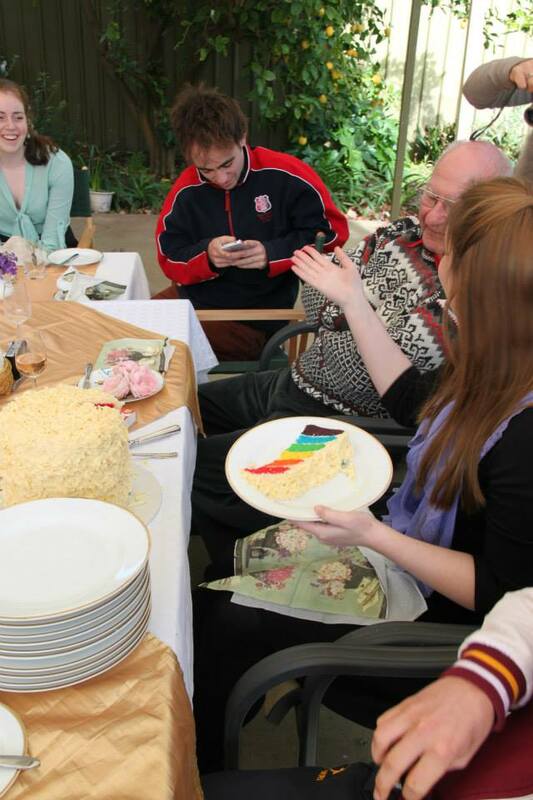 To surprise my family at my 19th Birthday lunch, I decided to make a rainbow layer cake and keep it top secret. While it was time-consuming and challenging and, I admit, I had a few diva moments where I wanted nothing more than to throw the darn cake out the window, it was definitely worth it for the squeals of surprise and delight and the warm fuzzy feeling it gave me. I had, ambitiously, pictured it covered with perfect snow white roses. But it wasn’t to be when my rather overpriced Wilton star tip exploded and I was left with a huge mess and a 2-minute noodle effect. Still I persevered, and when topped with some flowers it didn’t look too bad. I have attempted to make this recipe idiot-proof (if I can do it, you can!) and so have used a packet cake base and converted all measurements. 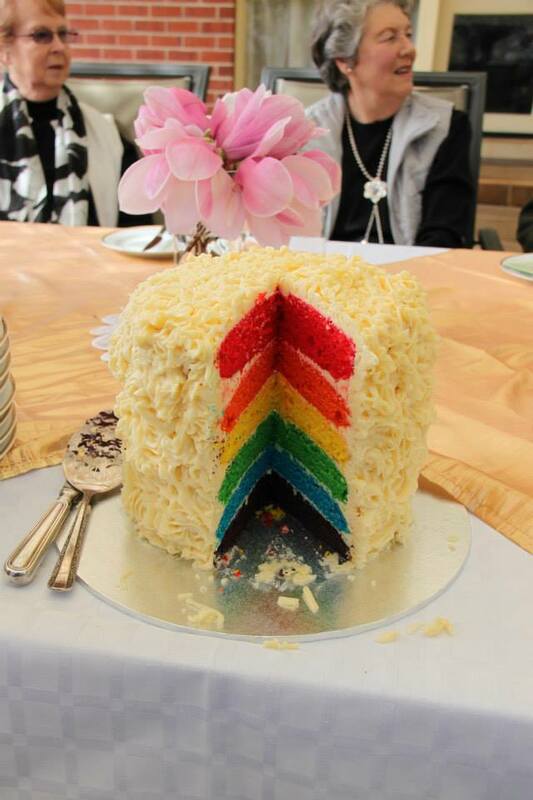 Good luck, this cake isn’t for the faint of heart! 1. Heat oven as directed on the Betty Crocker cake box. Spray three 20cm round cake pans with cooking oil spray. 2. In a large bowl, beat cake mix and other ingredients as directed by the cake box (I have stupidly thrown mine out and can’t remember exactly but I’m pretty sure there were eggs, unsalted butter and milk) *remember to double the quantities as you’re using 2 boxes worth* until well combined. 3. Divide batter evenly among 6 bowls. 4. 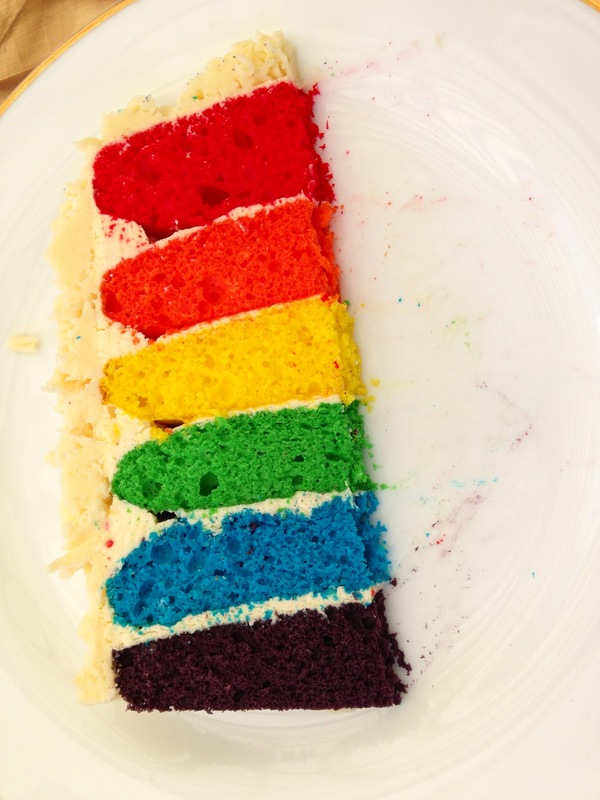 Using food dye and a small quantity of water, make a red, orange (using red & yellow), yellow, green, blue and purple (using red and blue) paste. Add one colour to each bowl and mix until all the dye is incorporated. It might take a few goes to ensure your colours are really vibrant, but it is definitely worth making sure they are for the finished product. 5. Refrigerate the green, blue and purple batters until ready to bake. 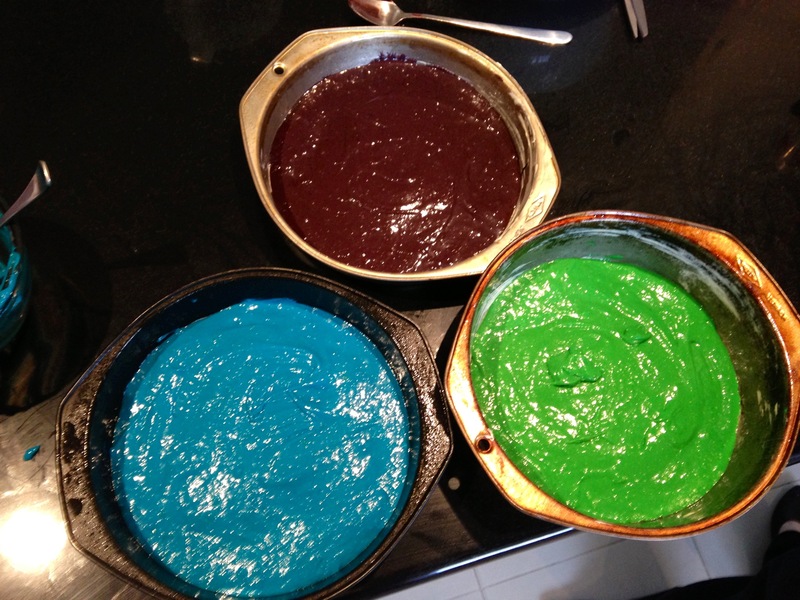 Pour remaining 3 colours into the 3 prepared cake pans. 6. Bake for 18-20mins or until a skewer inserted into the middle of the cake comes out clean and the cake has started to pull away from the edges of the pan. Cool 10 minutes. Remove from pans and gently place onto cooling racks to cool completely. 7. Wash and dry cake pans. Lightly spray with cooking oil and then pour in the remaining 3 batters and repeat the baking process. 8. To make the first batch of buttercream, add egg whites and sugar to a large metal bowl and place over a pot of simmering water, whisking constantly but gently until the mixture reaches 70 degrees C or until the sugar has completely dissolved and the egg whites are hot. 9. With whisk attachment of mixer, begin to whip the eggwhites until the meringue is thick, glossy and the bottom of the bowl feels neutral to the touch (NOT WARM). 10. Switch to paddle attachment and, with mixer on low speed, add butter cubes, one at a time until incorporated and mix until it has reached a silky smooth texture (if it curdles, keep mixing and it will eventually come back together). 11. Add vanilla, continuing to beat on a low speed until well combined. 12. Trim rounded tops off cakes to level (if necessary). Place the purple layer on the plate you wish to serve the finished cake on. Spread with buttercream to within a quarter of an inch of the edge. Place blue cake on top and repeat. Then add green, yellow, orange and, finally, red. 13. Spread a light coat of buttercream on the top and sides of the cake to seal in crumbs. 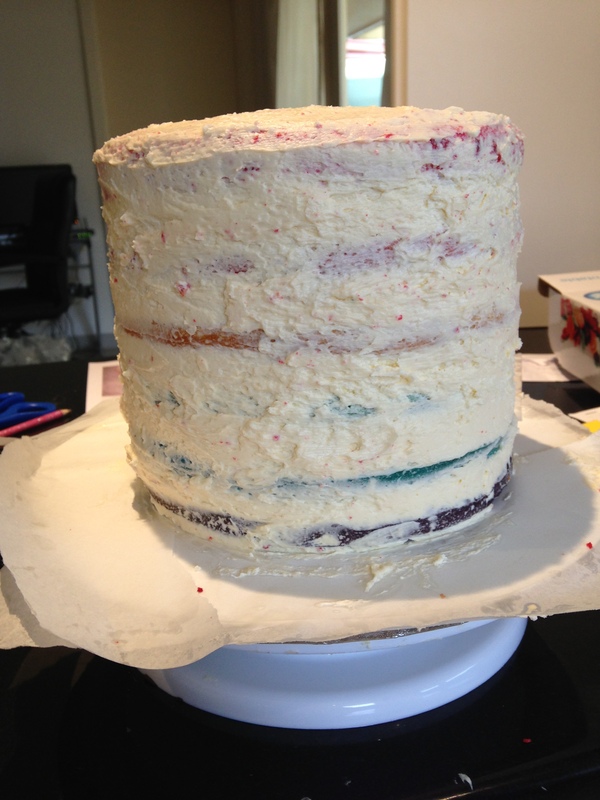 Then place the entire cake into a freezer while you make the second batch of buttercream. 15. Remove cake from freezer, prepare a piping bag with a Wilton star tip (I used 2D) and fill piping bag about 2/3 full with frosting. 16. 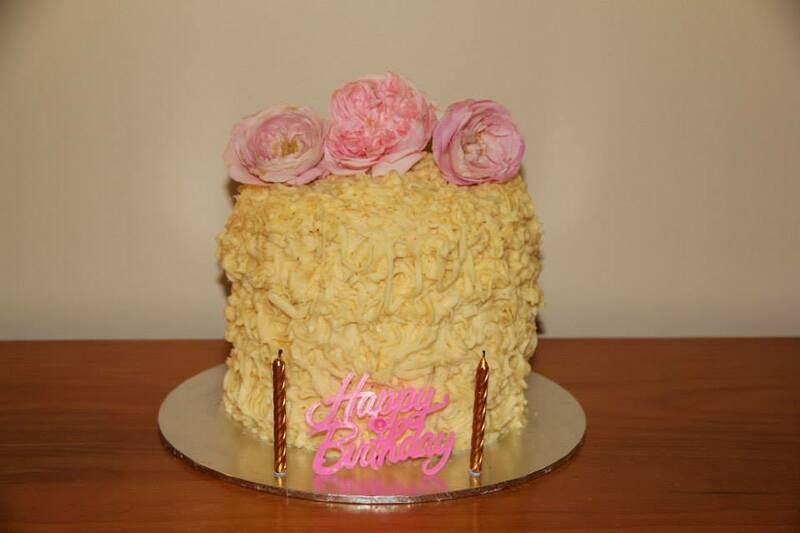 To make buttercream roses, starting at the bottom of your cake, hold your piping bag perpendicular to the surface you are icing, starting the centre of your desired rose and with a small amount of pressure, pipe in clockwise spiral around your centre, about 1 1/2 rotations or until your rose is of the desired size. 17. Repeat for the whole bottom row and then start a new layer, with the centre of your roses between the two roses below. 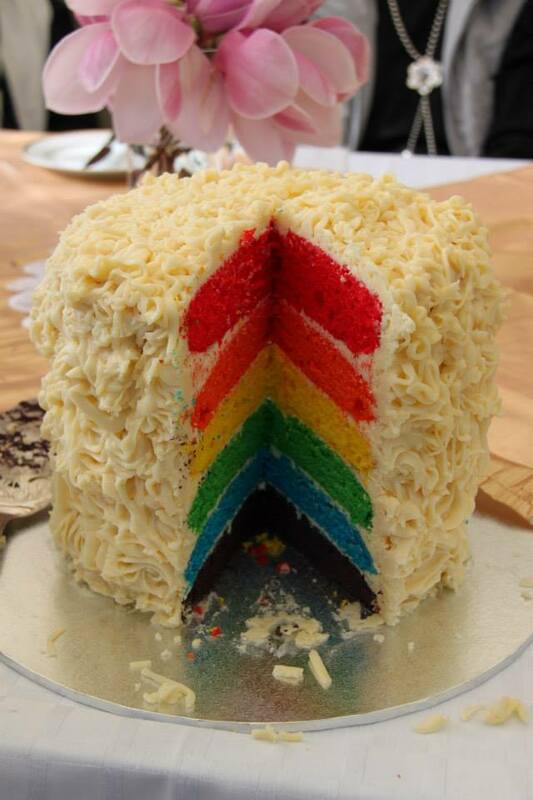 Continue until the cake is fully frosted. 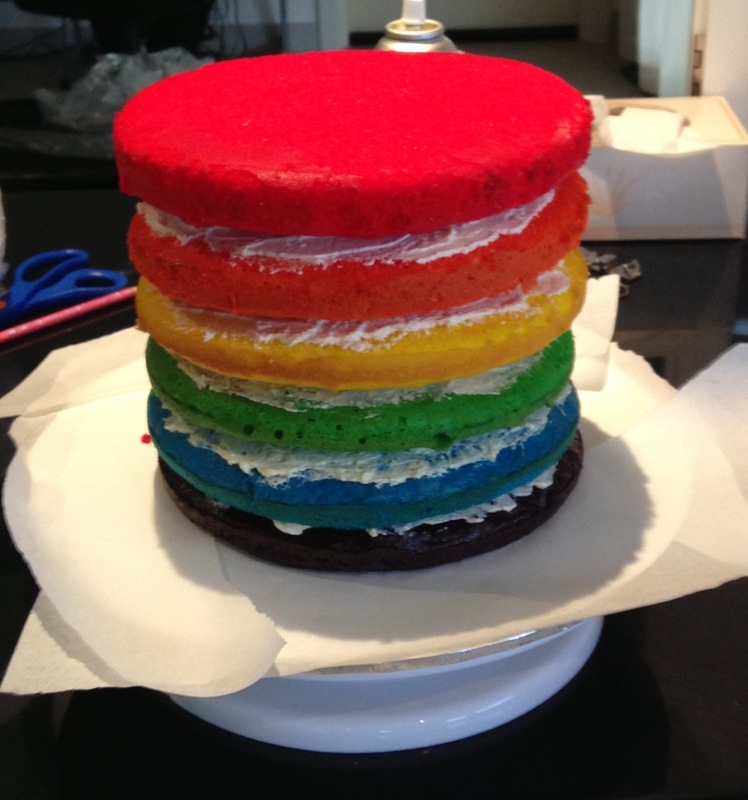 Alternatively, just spread the buttercream thickly over the cake and decorate as desired. Enjoy! Swiss Meringue Buttercream recipe adapted from Dessert Design Life.